There’s a lot of news and hype surrounding the arrival of consumer ready VR devices and head mounted displays. Each device has it’s own strengths, some are targeting specific niches, and there’s a lot of overlap between all of them. The most divisive topic has been VR input and this has been a polarizing topic for those initially interested in the HTC Vive or the Oculus Rift. With all of that considered, it’s been difficult to do an apples to apples comparison of the devices, specifically the cost to buy into any particular VR ecosystem. I was interested in doing a cost breakdown for each device and found that I had to make a few concessions for each system to bring them onto a level playing field or at least provide context for comparison. Mobile VR is its own world and can’t be fairly compared to the higher performance devices. 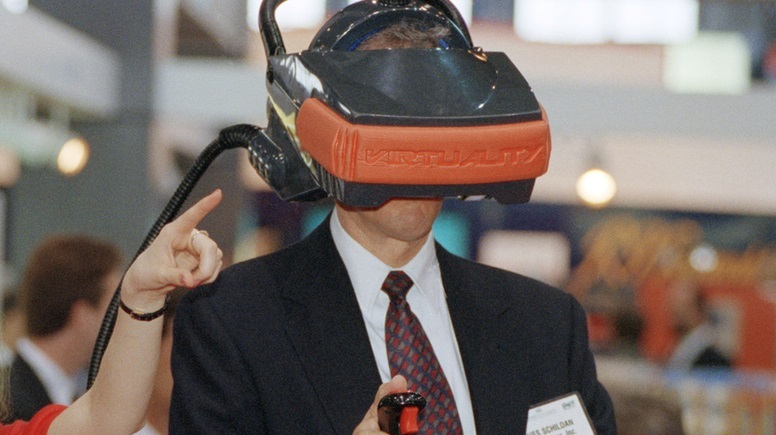 That being said it’s most peoples first introduction to VR and it can be very compelling. There are really only two players at this end of the field. The first entry point due to its cost and ability of the Cardboard app to work with almost any smartphone. I am going to concede the cost of the phone (who doesn’t have a smartphone?) and only include the investment for the headset. This is the second option for mobile VR and is leaps and bounds above Cardboard. 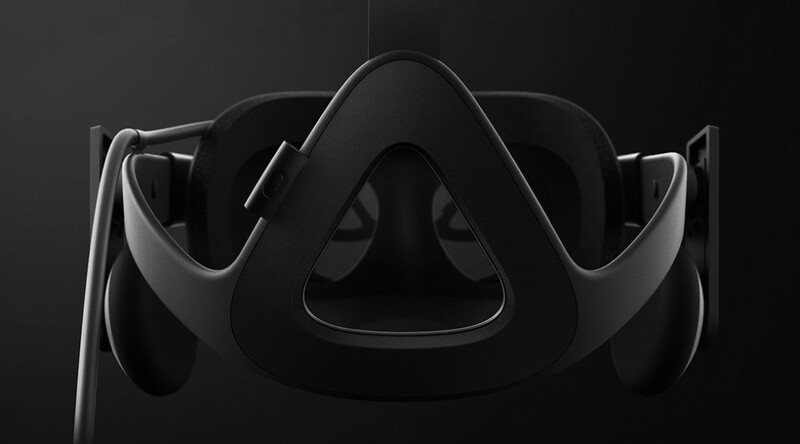 It has the Oculus brand and engineering by Carmack so it has a very specific performance target for high quality VR. This is again difficult to price since it requires a high end Samsung phone that may or may not be subsidized by your carrier. A smart phone is also of higher utility than a dedicated headset which again makes it difficult for comparison. Regardless, I am going to include the cost of an older S6 unlocked phone as part of the package. An input device such as a game pad may be required for some experiences but I’m going to ignore it for now. This is where the comparison gets interesting. The Oculus Rift, HTC Vive, and the Playstation VR are all fighting for a similar market share each with their own offerings and system advantages. VR input becomes a big deal in the comparison as some systems will offer tracked 1:1 input at launch and others won’t. In this comparison I will look at a the complete buy in for a full system that includes tracked 1:1 input. This seems like the most equal comparison point and provides insight to the nuances of each system. This is the lightweight contender at this end but is poised as the breakthrough hit since there are many households that already own a PS4. The PlayStation VR will extend the PS4 console and work with the system’s camera and Move controllers. Sony is offering a launch bundle that will include the headset, controllers and camera which appears to be the most economical option. The head set is available by itself if you already own the controllers and camera. It will be interesting to see if Sony offers a complete bundle that will include the head set with the console for additional savings. The Rift was positioned as the first consumer ready VR headset but has appeared to have stumbled as release neared. Its main competitor, the HTC Vive, offers a 1:1 tracked input solution that will not be included with the Rift at launch. 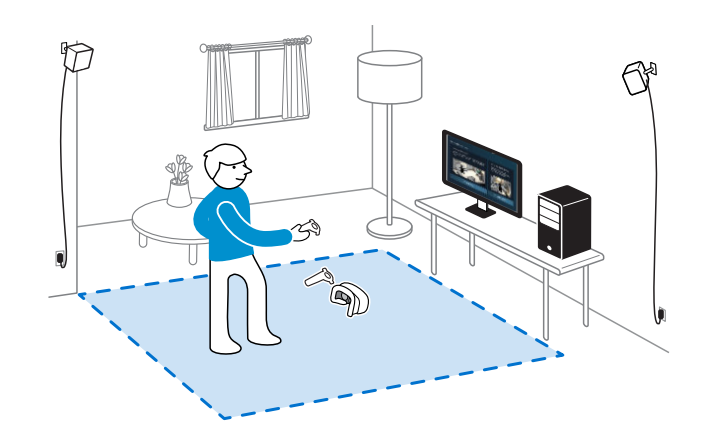 Oculus is offering their Touch input device a few months after the initial Rift launch. Details are still preliminary on the Touch including price and availability but I will use an estimate guess in this comparison. This is the first headset in this comparison that will require a dedicated PC for VR. This blog has covered a few different options for building a VR PC and I will be including the results of the Budget Rift PC Build in the pricing. Take this pricing with a grain of salt because it may include a monitor or keyboard that you may already have. Complete Oculus bundles are available with different options but at a slightly higher cost than the package below. 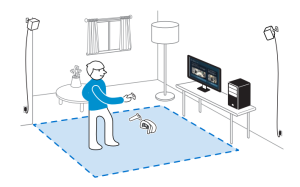 The Vive is the most complete package available at release as it offers 1:1 tracked input in addition to the headset. This inclusion raised the bar for comparison for all of the devices in this category because the input option could not be ignored. The price comparison also includes the results of the Budget Rift Build with the difference of a $18 savings for less RAM since the Vive requires only requires 4GB to meet the minimum reccomended spec. In the end this is a frustrating conclusion. There are many options available for VR experiences but the two high end versions are neck and neck in cost. The unannounced price for Oculus’s touch solution requires an estimate for price comparison and is ultimately is the deciding factor between the price of the two systems. This provides an unsatisfying conclusion since the pricing of the Oculus system is based on speculation. When was the last time the time you just met the minimum requirements? You want your VR experience to be better than the minimum. Forget about optimization. You want power. You want performance. I wanted to build something bigger and better. This is the quest for the best Oculus Rift VR PC build. Get that credit card out, here we go. Processor – Intel Boxed Core I7-6700K – Powwwwer. Doesn’t come with a cooler so you know it’s serious. Cooler – Corsair Hydro Series H115i Liquid Cooler – Maximum cool. Radiator with dual fans. You may need to tweak the fan speeds or just wear headphones all the time. Motherboard – MSI ATX DDR4 Motherboard Z170A XPOWER – Overclock as much as you want. Rock solid board with a great BIOS. Unnecessary amount of USB ports. Graphics Card – GIGABYTE GeForce GTX 980Ti 6GB WATERFORCE – This is where the rubber meets the road. Stable even when overclocked. Spring for the water cooled version and grab updated drivers when installed. Memory – Corsair Vengeance LPX 16GB – DDR4 memory that can shed the heat. 16GB or 32GB, your choice. Storage – Samsung 850 EVO 2TB 2.5-Inch SSD – Everyone loves a SSD. Make sure you don’t run out of room. Case – NZXT H440 Mid Tower – Sleek case with excellent cable management and sound deadening. Display this proudly. Power Supply – Corsair HXi Series, HX750i, 750 Watt – Make sure your components get nothing but the finest electricity. Powwwer for all that overclocking. OS – Windows 10 USB Drive – About as exciting as Windows can get. On a USB stick for easy installation. That’s it. Buy it, build it, and get ready to do this all again in 12 months. My previous Rift PC Build slightly exceeded the recommenced specs by using a few higher end components and was built to support some future upgrades. I wanted to shoot for the lowest price components to deliver the most inexpensive Rift build possible. The selection process was straightforward since Oculus’s recommended specs already have the CPU and graphics card already selected – I only needed to find the supporting components. Two key decisions I made were eliminating an optical drive to save money and the inclusion of a SSD over a regular hard drive for performance reasons. Physical media is almost dead and if you’re building a new PC you should have a SSD otherwise you’re selling yourself short. Here are the components and a few details about the selection process. Processor – Intel Core i5-4590K – This is the minimum Oculus recommended processor so no options here. It’s a Haswell processor from Intel, will offer excellent performance for the cost. Note that this includes its own cooler, fan, and thermal paste – nothing else is required here! Graphics Card – EVGA NVIDIA GeForce GTX 970 4GB GDDR5 – This is the minimum recommended chip set from Oculus and the most inexpensive card that has it. Great performance for the price and EVGA is a quality manufacturer. Motherboard – MSI ATX DDR3 2400 LGA 1150 – supports Z97, modern and inexpensive. (2) USB 3.0 ports for the Rift. This is a great foundation for a new PC and has an awesome BIOS screen for easy setup. Memory – Crucial Ballistix Sport XT 8GB Kit – Two sticks of 4GB RAM to meet the minimum requirements. Nothing special here but it does look cool! Storage – ADATA SP600 2.5-Inch 64 GB SATA III – Solid state drive for the OS. It’s on the small side at 64 GB but it will make the entire system snappy. Consider a 3.5 SATA expansion disk for game storage. Case – Rosewill ATX Galaxy Case – Nice inexpensive case with plenty of room inside. I don’t think this is winning any style awards but it fits the bill and Rosewill makes quality products. Power Supply – EVGA 500W – Inexpensive but well made power supply, plenty of juice to go around. OS – Windows 10 Home – USB Drive – The new standard here, shipped on a USB drive for easy installation. Monitor – Acer S220HQL Abd 21.5-Inch LCD – Inexpensive LED monitor that’s great for gaming for when you’re not wearing the Rift. This should be everything you need to put together an inexpensive Rift PC. I included Amazon links for everything as they have competitive prices and I recommend them for their Prime shipping and ease of exchanges. Never built a PC before? It’s easier than you think – everything snaps together. I recommend the step-by-step guide at Tom’s Hardware. 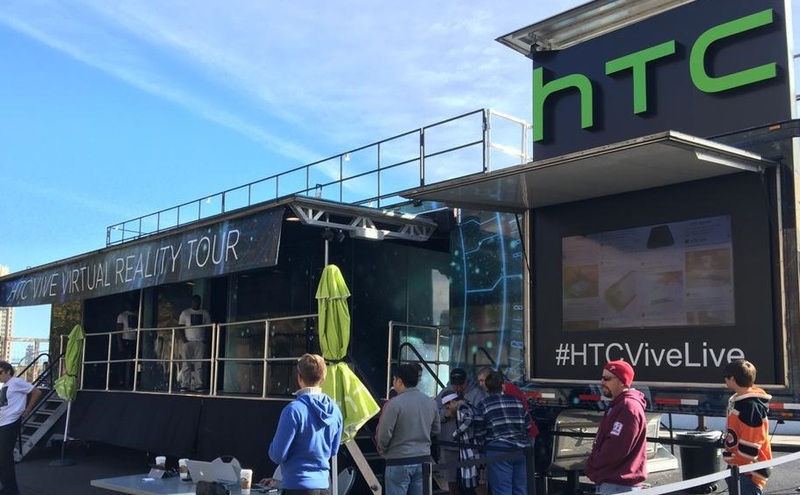 I was lucky enough to try the HTC Vive at their event in Philadelphia this morning. They are able to show the ~15 minute demo to about 80 people in one day. Friendly people running the event and other VR enthusiasts waiting for the demo. After making small talk with the event staff they wave you into one of the testing rooms and are immediately set up with the head set, headphones, and controllers. There’s a quick tutorial in a Matrix Construct type of environment regarding the Chaperone system and the controllers. Part of the tutorial has you use the touch-click wheel on the controller which was a cool interface method but not really used again during the demos. After the tutorial was complete they jump right into the 4 demos. This was a well executed demo to lead off with. 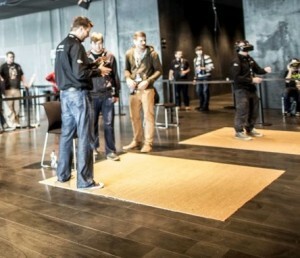 It demonstrated the immersive feeling of an environment and the ability for VR to show scale and perspective. You can walk around a little bit and there’s plenty of stuff to look at. A whale swims by and it’s very impressive to feel the scope and scale. It was a well designed introduction and probably my favorite demo. Next up was the kitchen demo from Job Simulator. Extremely fun and a good introduction to the controllers. Intuitive to pick things up and manipulate them. A little strange how some items “snap” in orientation to the controller. I’m curious how the Oculus Touch controllers feel, it may feel more natural to grasp items with a middle finger trigger. This seemed a bit silly at first because I wasn’t sure what to draw. I doodled some 2D shapes and then started to move my head around so see things from an angle. This is where it clicked, I should be drawing and thinking in 3D. I immediately started to sketch a cube and sphere. I ran out of time before I could accomplish too much, I would love to have a second shot at this demo. The controllers were well utilized, one controller is your brush and the second is a color palette. It was a very natural setup. I actually saw this video a few weeks prior to the HTC event so this was slightly spoiled for me. This was an extremely impressive demo though. Intuitive to manipulate everything and a well done environment. Valve had fun playing the sense of scale, funny to see a drawer full of tiny people followed by the feeling of being in an enormous warehouse at the end. The exploded robot view demonstrates the potential application in engineering or any type of design industry. The headset was lightweight and comfortable. I made a mistake and I didn’t take the time to adjust the headset straps to my head. One side of the headset kept drooping and it would cause everything to loose focus in that eye. Annoying but it would take a minor correction every minute to get my eye back in the sweet spot. No motion sickness like I experienced with the DK2 but after removing the headset I had a moderate headache – I’m guessing it was due to eye strain. 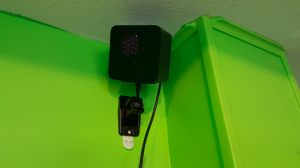 No tracking issues with headset, everything was extremely smooth and fluid. I bumped into the Chaperone system a few times which was a bit jarring but it makes complete sense in implementation. Screen door effect could be seen if I looked for it but it was virtually unnoticeable in the demos. The only time it cropped up was at the end of the Robot Repair demo where I was looking in the far distance of the warehouse. The controllers were intuitive to use and comfortable. I would have liked to use the click-wheel more, I think it was possible in Tilt Brush but I forgot it was there. No tracking issues, everything was 1:1. This was my first experience with positional controllers, I’m now curious to try Oculus Touch. A very cool experience overall, HTC is smart do demonstrate this technology as it’s very hard to advertise and communicate the feeling of VR. GTA V has been one of my favorite games of the last and now current generation of consoles. A PC port is on the way and it will benefit from higher horsepower machines and a lively modding scene. Rockstar introduced a first person mode to the game when it made the leap to current generation consoles. The mode begs for Oculus support and we’ll see it one way or another soon after the game’s release. The open world of Los Santos is gorgeous and ripe for exploration with the current DK2 or the CV1. Consider future support by the popular iCEnhancer mod and you’ll have a near photo real gaming experience. The game will be an absolute monster, especially if it requires a +75 fps frame rate for Rift support. These requirements are nothing more than a starting point. We’re going to need a beast of a machine for a comfortable Rift experience. Processor – Intel Core i7-4790K – New Haswell processor from Intel, will offer excellent performance for the cost. You can overclock it too but performance will be fine right out of the box. Motherboard – MSI Z97-G45 – supports the Z97 chipset, modern and flexible for different builds. This is a solid foundation for the system. Graphics Card – EVGA GTX 970 Superclocked 4GB – Not exactly cheap but this card delivers excellent performance for the price. Don’t skimp here. I’m actually tempted to recommend a beefier card here but prices get out of hand pretty quickly. Memory – Crucial 8GB 240-pin DDR3 – I’m recommending two 8GB sticks. Storage – Samsung SSD 850 EVO 250GB – Solid state drive for the OS. I’ve had bad experience in the past with SSDs so I prefer to stick with a brand name. Case – Corsair Carbide Series 400R – Nice clean case that’s easy to work on with plenty of cooling. Power Supply – Rosewill 80 PLUS BRONZE 650W – Very nice power supply to run the system and support future upgrades if necessary. OS – Windows 7 Professional 64-Bit – Everyone’s favorite Windows OS, I still prefer it over Windows 8. This should be everything you need to put together a solid gaming PC that can tackle GTA V. The system is built with upgrade potential so with carefully selected upgrades (namely the GPU) this rig can keep you current for the next few years. Total cost is around $1400 which is downright reasonable for a new gaming rig built from the ground up. 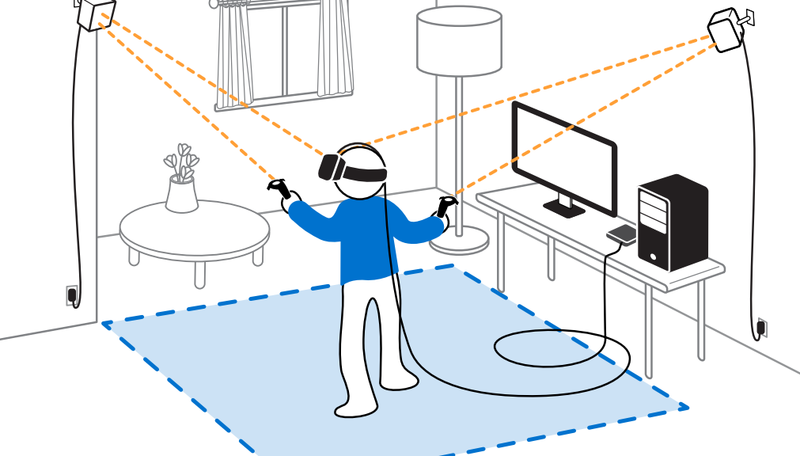 Headphones are preferred for the Oculus Rift as they provide a much more immersive experience than speakers. There are many wired headphones that will work well with the Rift but one of the key requirements is comfort. Wireless headphones may be preferred to eliminate the inevitable tangle of wires when wearing and storing them with the Rift. Latency is a concern with wireless headphones and most Bluetooth headphones introduce a noticeable amount. Here are my two picks for headphones. The wired Audio Technica set is comfortable and the cord can be disconnected at the ear to make untangling wires much easier. The Sennheiser wireless set is rechargeable and uses a digital signal to eliminate any interference. I’m personally using an older pair of the Sennheisers, the RS140 model that has been discontinued. Looks amazing! Oculus did a very nice job on the product design – note the cover plates for the HDMI and USB connection ports. The front face looks clean with everything integrated when the cover plates are installed. The over the head routing for the cables is also very sleek. The Rift will eventually benefit from a 4K resolution which will have a tremendous impact on its clarity for gaming and other computer tasks. It may start to be taken seriously as a replacement for traditional computer monitors as John Carmack has claimed. The 4K improvement for draw distance clarity and the text readability can be seen with the previously discussed Oculus Simulator. It’s like night and day. Oculus has been vague about the actual resolution of CV1 although they say it will exceed 1080p. Achieving 4K in an eventual consumer unit has two current obstacles. The first obstacle is the availability of small form factor 4K OLED panels. They may theoretically exist but they are produced in extremely low volumes and are expensive. Price would certainly drop as production ramped up to meet a wide demand for interested cellphone or tablet manufacturers. Facebook’s acquisition of Oculus may give them the cash and buying power they need to design their own custom panel and buy in enough volume to make the manufacture of a panel inexpensive. The second obstacle will be the limits of current computer hardware. Rendering 3D scenes at a 4K resolution and the high frame rate required by the Rift is extremely taxing (if possible) on current PC hardware. Gaming has recently adhered to a 1080p 60fps standard waiting to the cost of 4K equipment to fall. While a $2500 “low cost” 4K build may be possible, it will be many months before a rig of that caliber is affordable to many consumers, and at that point it may not even meet the required frame rate to support the Rift. Over the last few months I’ve heard nothing but praise sung for the Oculus Rift. More recently while I have ramped up my research I’ve found the most common complaint regarding the Oculus is the limited “draw distance” due to the low resolution of the display. Anything in VR that is of a great distance from the viewer will be a challenge to display with the current Oculus technology, including DK2 and CV1. The issue isn’t actually draw distance in a traditional sense. Your PC is theoretically able to draw an object at any distance whether it be two feet or two miles. The challenge is displaying that object on a screen at a given resolution. The clear lines your PC sees must be broken up and represented by individual pixels. The more pixels, the more clarity for displaying your object. I lack the knowledge and effort to really give this explanation justice but the Oculus struggles with “draw distance” because it is forced to use half of the normal screen real estate to display an image. A normal image displayed on a monitor will take up the entire screen. To display a stereoscopic image you need two slightly different copies of that same image, one for each eye. That’s fine if you can display those stereoscopic images individually on separate monitors. But if you want to display those images side by side on one screen (like the Oculus does) then you need to squeeze each image to fit both of them on screen. All of a sudden you’re using half a screen to display a full screen image and your using less pixels per eye. With fewer pixels objects lose clarity. This is especially true for objects that are farther away from the viewer. An object that is displayed with clarity and definition in a full screen image may be reduced to a smudge of pixels in VR. 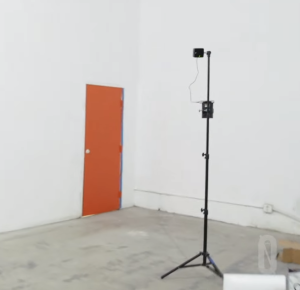 Anything of great distance from the viewer will be a challenge to display in VR. To see the resolution and draw distance limitation issue illustrated, focus at a point on the map and switch between the available resolutions. Notice how much of an impact this has on text. We should be happy that everything from here on out will be an improvement on DK1. DK2 and CV1 look comparable. 4K is obviously where this technology is headed but will be further down the road. Available 4K displays need to drop in price and rendering smoothly at 4K will massively tax current PC hardware. Note that I’ve read complaints about the above simulator regarding the fact that it doesn’t accurately represent the pentile pixel arrangement of future displays. This is a minor quibble with a great demo.